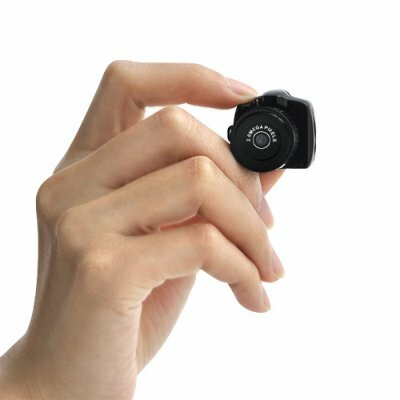 Successfully Added Advanced World's Smallest Camera (HD Edition) to your Shopping Cart. Designed to look like a miniature version of a professional DSLR camera, this awesome miniature camera does still function as a high quality digital video recorder and picture camera - and is guaranteed to attract a lot more attention than its full-size counterpart! We know you like cute things. Like rabbits and butterflies and micro cameras. Well, at least Japanese girls do. Anyhow, if “cute” is your thing then I guess the DV59 micro camera could fall into that category. A warning though: keep Tinkerbell away from the camera! You wouldn’t want your cute little Chihuahua to mistake it for a snack and choke on the thing. The DV59 delivers a great value considering the same camera is selling right now for $120 on a famous Japanese website. The HD image and video quality is the best on the market for its price range and you’ll be quite satisfied with the results. Get one as a memorable and unique gift or keep one on your keychain to capture all of life’s spontaneous moments with the quick press of a button. Hi bought a lot of stuff from China which mostly was bad quality. I ordered the camera from Chinavasion and was surprised about the quality of build. All was working fine. Just the manual was a word document which did not start in English. I've learned to press the single button 2 seconds to switch on. Then press it again for 3 seconds to start camera. Put it in helmet of GoCart, Model train or model RC car and start through. Very easy. No cable. No battery to handle. No charger. Just USB again to receive the MP4 videos and watch them in good quality I was surprised about. The MicroSD card was on the outside of the camera but also when the whole RC car was crashed the MicroSD card stays stable in the camera! on 2011-07-21 11:58:30 Ótima camera! Excelente produto! Sou de São Paulo - Brasil, comprei dia 20/06/2011 e recebi em perfeitas condições em 17/07/2011. Qualidade da foto muito boa, qualidade do video muito bom! me surpreendi com a qualidade dessa mini camera. Realmente é o que está no anúncio,não acreditei muito mas agora que tenho em mãos achei excelente!